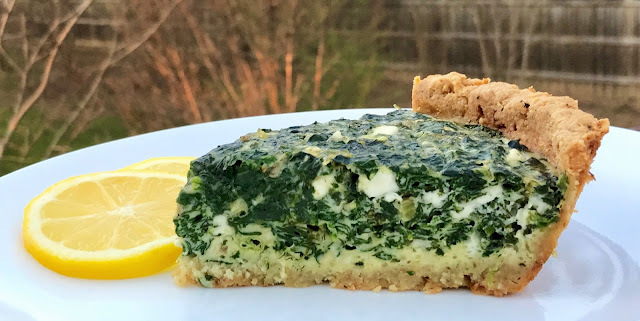 I know this may sound a bit silly, but this evening I made my Greek Style Spinach-Feta Pie to work some more green into our menu for St. Patty's Day tomorrow. I know it's a bit silly to be going Greek to celebrate an Irish holiday...but food never discriminates! LOL Plus, I really miss this dish. I have a number of different variations of this pie, but my favorite is made with my buttery almond crust. To save time, my crustless version is also good. It's also good if you have leftover bacon to add as well, just be careful about adding too much because feta is a saltier cheese. I used the remainder of the pound of Olivia's Organic Baby Spinach that I had leftover from the chicken soup I made earlier in the week. Since I had so much spinach to use, I added a couple of extra eggs to my pie this evening (I usually put 5 eggs in the filling but this evening I used 7). With all the spinach, I could have added a couple of more eggs and been good, but since it's just hubby and I, I didn't want to make too much. I used green onions instead of regular onions so this was a super green pie with over 3/4 pound of chopped spinach, dill, and the green onions. There won't be any pinching going on in my house for sure! So, if you are one of those non-corned beef people, then this pie might be the perfect dish to make to cover you in the green department for Saint Patrick's Day tomorrow. 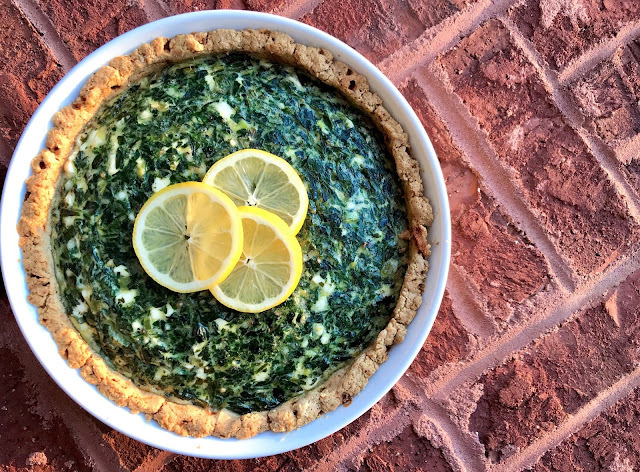 Check out tonight's Spinach-Feta Pie below. You can find the recipe with more photos here: Greek Style Spinach-Feta Pie. Enjoy! I love your extra green spinach pie! Hubby talked me into letting him make corned beef & cabbage (which isn't really Irish, either, I hear) but the pie will be on the menu again soon. It's one of our favorites and I think I'll make it extra green this time!